The Supreme Court of the United States of America (SCOTUS) on Friday ruled with a 5-4 majority that the police generally need a search warrant to obtain broad access to data that shows the location of cellphone users, unless a warrant-less search is necessary in view of the"exigencies of the situation". Authoring the majority judgment in Carpenter Vs United States, Chief Justice John Roberts was joined by liberal Justices Ruth Bader Ginsburg, Stephen Breyer, Sonia Sotomayor and Elena Kagan. They held that cellphone location records deserve enhanced protection under the Fourth Amendment which protects people from unlawful searches and seizures, opining that "individuals have a reasonable expectation of privacy in the whole of their physical movements." Conservative Justices Anthony Kennedy, Clarence Thomas, Samuel Alito and Neil Gorsuch authored four separate dissents, sometimes joining each other but none finding agreement among them all. Each time a phone connects to a cell site, it generates a time-stamped record known as cell-site location information (CSLI). In the case at hand, the FBI had identified the cell phone numbers of several robbery suspects, including the petitioner, Timothy Carpenter. The prosecutors had essentially made their case against him largely relying upon information provided by his wireless carriers that showed Mr. Carpenter’s whereabouts over several months. The CSLI evidenced his presence near several of the crime scenes at the times the robberies occurred. The prosecutors had not sought a warrant, as it would have required a showing of "probable cause" to believe that the records show evidence of a crime. They had instead sought the data under the Stored Communications Act, which requires only that there are "reasonable grounds" to believe the information is relevant to an investigation. Mr. Carpenter tried to suppress the data, arguing that the Government’s seizure of the records without obtaining a warrant supported by "probable cause" violated the Fourth Amendment. The District Court however denied the motion, and the prosecutors used the records at trial to show that Mr. Carpenter’s phone was near four of the robbery locations at the time those robberies occurred. Mr. Carpenter was thereafter convicted. The Sixth Circuit affirmed this judgement, holding that Mr. Carpenter lacked a reasonable expectation of privacy in the location information collected by the FBI because he had shared that information with his wireless carriers. 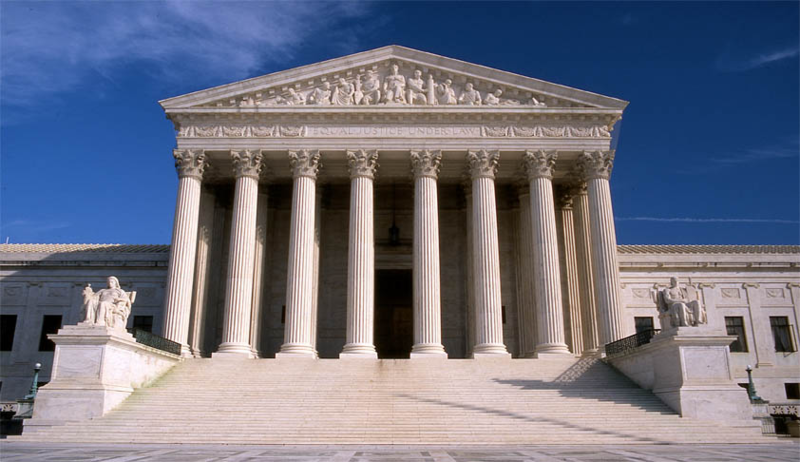 However, the Supreme Court now opined that the Fourth Amendment does not protect only property interests but certain expectations of privacy as well. The Court began by examining the contours of the protection offered by the Fourth Amendment and went on to note that it was now confronted with application of the amendment to a "new phenomenon", i.e. the ability to chronicle a person’s past movements through the record of his cell phone signals. It then went on to reject the contention that the data was not to be protected by the amendment as it was already being shared with a third party, i.e. his wireless carrier, opining, "We decline to grant the state unrestricted access to a wireless carrier’s database of physical location information. In light of the deeply revealing nature of CSLI, its depth, breadth, and comprehensive reach, and the inescapable and automatic nature of its collection, the fact that such information is gathered by a third party does not make it any less deserving of Fourth Amendment protection." It further noted with concern the amount of data that can be gathered by tracking a person's cellphone, observing, "In fact, historical cell-site records present even greater privacy concerns than the GPS monitoring of a vehicle...While individuals regularly leave their vehicles, they compulsively carry cell phones with them all the time. A cell phone faithfully follows its owner beyond public thoroughfares and into private residences, doctor’s offices, political headquarters, and other potentially revealing locales...Accordingly, when the Government tracks the location of a cell phone it achieves near perfect surveillance, as if it had attached an ankle monitor to the phone’s user. Moreover, the retrospective quality of the data here gives police access to a category of information otherwise unknowable. In the past, attempts to reconstruct a person’s movements were limited by a dearth of records and the frailties of recollection. With access to CSLI, the Government can now travel back in time to retrace a person’s whereabouts, subject only to the retention polices of the wireless carriers, which currently maintain records for up to five years. Critically, because location information is continually logged for all of the 400 million devices in the United States—not just those belonging to persons who might happen to come under investigation— this newfound tracking capacity runs against everyone." The Court then went on to hold that the police must obtain a warrant to collect CSLI for criminal investigations. It however clarified that a warrant-less search might be justified in urgent situations such as the need to pursue a fleeing suspect, protect individuals who are threatened with imminent harm, or prevent the imminent destruction of evidence.